Silvania Pereira studied physics at the State University of Campinas, Brazil. 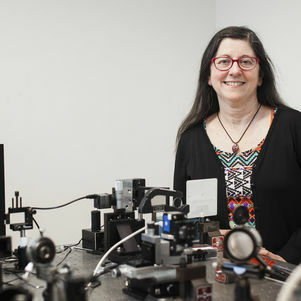 After her graduation she went to the United States where she joined the quantum optics group of professor Jeff Kimble at the University of Texas at Austin and later at Caltech, Pasadena. The subject of her Ph.D. thesis was quantum fluctuations in nonlinear processes. In 1994 she was awarded a Humboldt Fellowship and went to the University of Constance, Germany in the group of Prof. Jürgen Mlynek. The subject of her work was quantum tomography of nonclassical states of light. In 1996 she went to the Netherlands where she joined the group of Prof. Han Woerdman at the University of Leiden as a post-doc fellow. There she worked with quantum noise and polarization properties of semiconductor microlasers. In 2000 she was granted an individual fellowship "Stimuleringsfonds" from the FOM Foundation, the Netherlands, and since then she holds a permanent position at the Optics Research Group at the Delft University of Technology. The subjects of her work at this moment are optical scatterometry, beam shaping and aberration retrieval with applications in wafer metrology, optical mastering, adaptive optics and high resolution imaging. This work is done in collaboration with the industry and national/international universitites. Silvania Pereira is the (co-)author of several scientific papers, 2 US patent and participate(d) on the European projects MoreMoore, SLAM, SPAM, SURPASS, Clean4Yield and the European Network in Microoptics NEMO.